Performers put themselves out there for the world to judge them. Every little thing they do will come under scrutiny, judged by their looks and their talent. They are even judged by the normal everyday things they do. It is a hazard of their profession. Some performers have trouble determining how to balance real life with their professional responsibilities. Others, on the other hand, know exactly what to do and they use their influence to do good in order to help some cause. When that sort of powerful drive for humanitarianism meets immense talent is where the very best of the acting profession emerge. It is in this area of elite convergence where Outlander's Sam Heughan sits. It is because of his vast talent that he is so well known, but it is his drive to be a humanitarian that has endeared him to his fans around the world. It is his looks that likely grab most people at first, but that is only skin deep. He is so much more than that and it is everything that he stands for that makes him a beloved performer. It is his talent and dedication to doing good that has earned him the title of SpoilerTV's 2017 Reader's Choice Performer of the Year. In 2017, during Season Three of Starz's Outlander, Sam Heughan really got to shine as he delivered one heart-breaking and heart-warming performance after another. Unlike the two prior seasons, he spent nearly the entire first half of this season separated from his regular scene partner, Caitriona Balfe (Claire Randall Fraser). Together they have always been a powerhouse duo, but this season got to showcase just how fierce each performer is on their own. While Balfe had some incredible storylines, it was Heughan who got some of the most powerful material in the early half of the season. Throughout the season he took Jamie on a complex journey. At the start of the season he was an injured and broken man ready for death and by the end, he was full of life and fighting for the lives of those he loves most. Throughout each emotional and heartfelt moment, he further endeared Jamie to the audience. What is to follow will be a look back at some of Sam Heughan's most memorable acting moments from Season Three of Outlander. 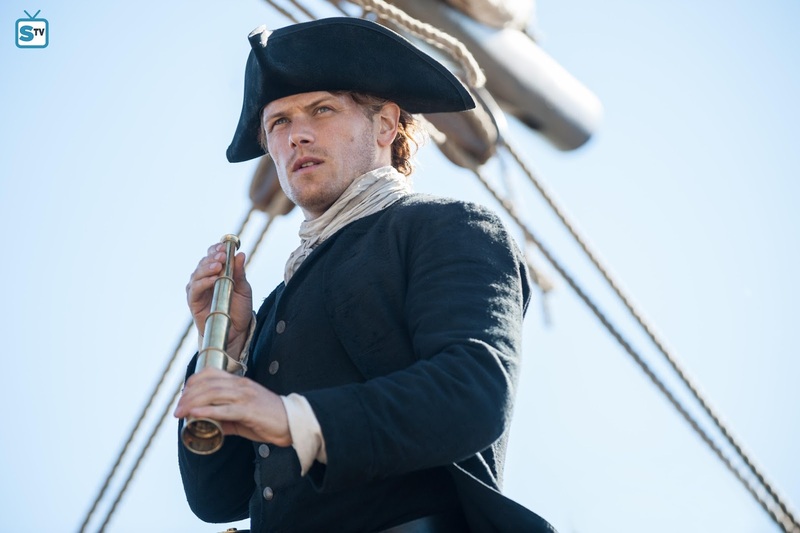 This season started with The Battle Joined (3x1), an episode that showcased Heughan portraying Jamie in a way he has never been seen before, in a very vulnerable situation. He had just sent his beloved wife through the stones and sustained nearly mortal wounds on the battlefield. There was no fight left in his broken body. The Jamie Fraser fans had come to know is a strong fierce man with a heart of pure gold. This Jamie Fraser was defeated and ready to move on to the afterlife. No matter how much he wanted to just forego the pain and slip away it is not in Fraser blood to just give up. His heart and mind were not in agreement as to what to do. His heart was broken and ready to just end it all. Thankfully his brain was still fully engaged and not ready to give up without one hell of a fight. What is so stunning about this is Sam Heughan managed to portray all of this extreme complexity with little more than his body. He had some terrific lines and he delivered them beautifully, but in regards to this episode, it was what he expressed between the lines that left the biggest impression. The first couple episodes of the season were quiet ones for Heughan. That's not to say he didn't have a lot to do because he did, but Jamie was lost in his own head for a while. He was more or less just going through the motions of life without really truly living. He was a shell of the man his family and fans had come to know. To be fair to Jamie, he had a lot of trauma to try and process and no one could ever blame him for pulling back the way he did. Surrender (3x2) was a powerful episode to display Jamie's grief. Even given the time that passed and his physical wounds that healed his heart is still bleeding. Jamie turned to trying to avoid feeling altogether to mitigate the pain. Heughan has immense control over his line delivery, but these first two episodes showcased just how profoundly talented he is. He’s so at one with his character that he has this profound ability to emote exactly what the moment calls for effortlessly. He also knows when to emote nothing and that's absolutely not a bad thing. The way he made his eyes void and blank was such a powerful display of what Jamie was feeling. The lack of emotion from Jamie said so much and was a powerful message of indescribable pain that he was suffering. Jamie would go on to allow himself to be captured to protect his home and family. He felt a great responsibility for what happened to Fergus (Romann Berrux) and a noble duty to protect others from that same fate. That event, along with Jenny (Laura Donnelly) confronting him brought him out of his head and back into the fight. But, he is a man of honor and needed to pay the debt he felt he owed. It was through these moments that Jamie's heart began the slow process of healing. As the episode wore on Heughan picked the perfect moments to start letting life slip back into Jamie's eyes and ever so slowly Jamie came back to life under Heughan's diligent attention to detail. Jamie’s heart would never be whole again without Claire and it would go on to be broken many times more, but this is the moment it healed enough for Jamie to become Jamie again. This season was full of big milestone moments. There was, of course, one huge one for which everyone was waiting. But, there were many other big moments before and after it. One of those moments occurred in All Debts Paid (3x3) where Jamie met the now adult Lord John Grey (David Berry). The introduction of adult Lord Grey was a big moment for the story. This is a man who goes on to play a big part throughout Jamie's life, so they had to nail these early encounters to secure the bond of the characters. Heughan has this innate ability to almost instantaneously connect with someone. It's a characteristic that he shares with Jamie. Both men are massively charismatic. The fact is that this is exactly how Jamie is written in the books. What audiences are witnessing is the result of complete perfect casting. In spirit, Sam Heughan is Jamie Fraser and Jamie Fraser is Sam Heughan. Heughan and Berry had an instant best buddy's chemistry that they easily translated to their characters. Even through these first tense encounters, there was an easy energy between them. Despite Jamie being the prisoner and John the governor, there was an ease between them. The performers played to that perfectly. 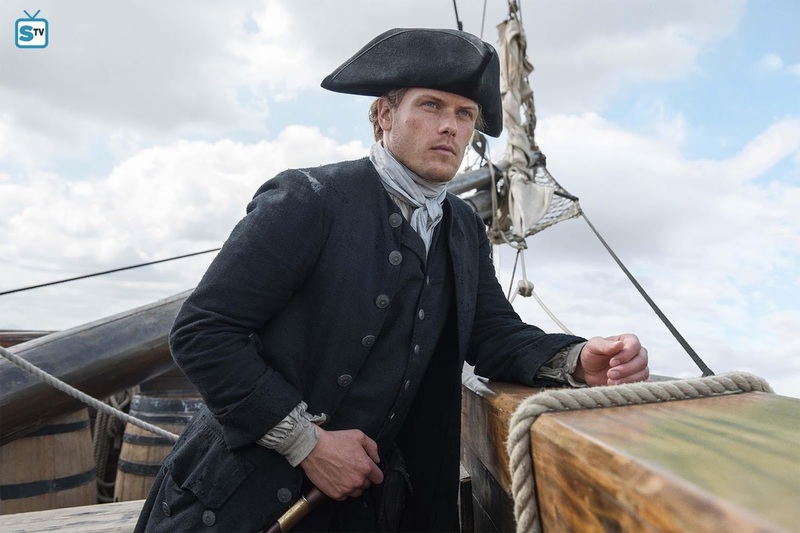 There is a moment in the episode where Jamie escapes and makes it to the island to search out if there was any truth to the rumor he had heard regarding the possible return of his wife. The rumor turned out untrue and Jamie had to return. Well, he didn't have to, but he did and for a very specific reason. He’d later go on to say it was because his men needed him, but there was more to it than just that. Upon his return, he sought out Lord Grey. After a brief confrontation and a reminiscence of their first encounter, Jamie reminded Lord Grey of a promise he had made when he was just a young boy. 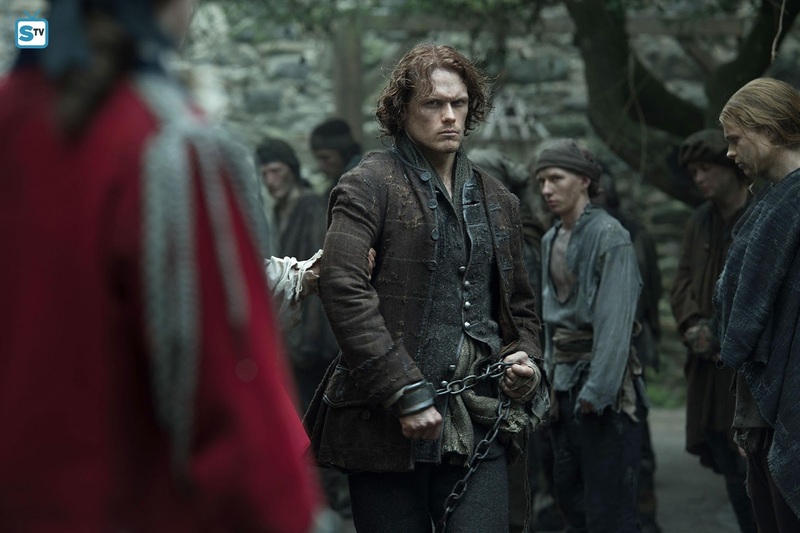 That was a promise to kill him upon the discharge of the debt that he owed Jamie. With the debt discharged by Lord Grey’s brother at Culloden, Jamie took to his knees and offered himself up to Lord Grey. The acting in this moment was stunning. Heughan kept Jamie composed while at the same time expressed a man crumbling from the inside out. Even with all the time that passed Jamie's heart was still raw from losing Claire. The failed exploration of the island had reopened festering wounds. He was spared on the battlefield by Lord Grey's brother even though death was the outcome he prayed for. This time he hoped that Lord Grey would finally dispatch him so his heart could find peace again. And yet again, while the words Heughan spoke were wonderfully delivered the moment with the greatest impact was the one where he said nothing. With Lord Grey's sword to Jamie's throat, Heughan chose to play that moment in a way that made Jamie look at peace. He was ready for the ache in his chest to stop. Then, when Lord Grey chose to not be "a murderer of unarmed prisoners", there was this soul-crushing look of disappointment that overcame Jamie. Heughan made the transition from at peace back to tormented in a split second and it was jarring, but that is how the moment had to be played, the audience needed to feel that for it to have the right impact on the scene and Heughan nailed it. Jamie's story would go on to take him into servitude of Lord Dunsany (Rupert Vansittart) and his family. It is while serving out his servitude that he encountered Lady Geneva Dunsany (Hannah James). While their encounters were interesting and an important part of Jamie's story it was the acting that Heughan did in Of Lost Things (3x4) with the young actor playing their son, William aka Willie (Clark Butler), that was the most profound. Heughan has proven to be an impeccable scene partner for his fellow adult performers and he proved that he is just as giving with his younger co-stars as well. 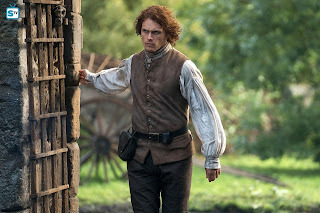 For purposes of a good life and a proper inheritance and right to his birth given title, Jamie had to make the tough choice to take the freedom given to him and leave his son behind. For as long as no one knows that Jamie is his father he believes Willie will live a good life. As Jamie prepared to leave, young Willie came to see the man he had come to call a friend. After a wonderful moment between the two Willie begs Jamie to baptize him. Jamie reluctantly obliges and Willie is baptized a "stinkin' Papist", this scene encapsulated so many feelings and emotions. Throughout the hour Heughan showed how Jamie was finally at peace getting to be around Willie to heartbroken again as he had to leave the boy. This scene allowed Jamie one final precious moment with his son, and when he baptized him and gave him the name "William James" there was so much pride in his eyes. Not only was it in his eyes, but Heughan delivered Jamie's lines with an incredible amount of joy and pride. It was a truly beautiful moment where Heughan shined and where he ensured that his young co-star was able to shine just as bright. Jamie's heart would go on to shatter into a million pieces as he left his son at the end of the episode. 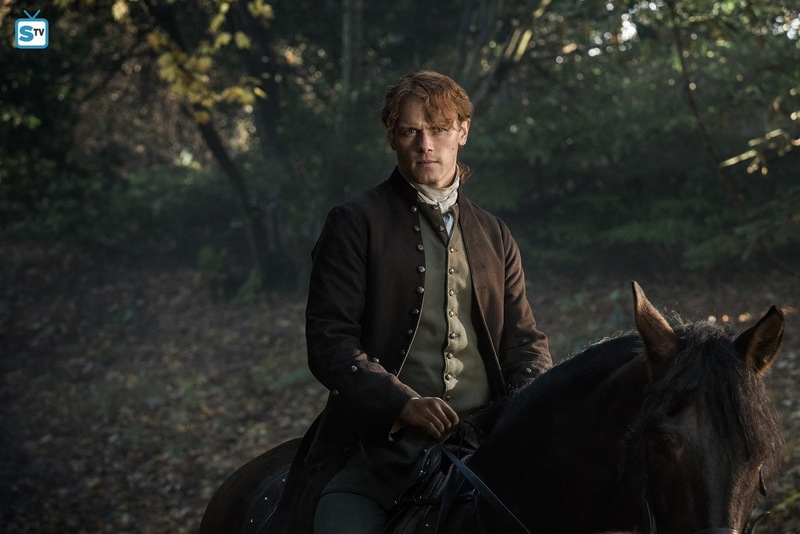 As Jamie rode away, Heughan kept a stiff jaw as Jamie fought to keep his emotions in check, he knew he had to leave but didn't want to. Jamie's heart now had two huge holes in it, one for Claire and one for Willie. Through Heughan's masterful acting, a heart-breaking moment occurs as Jamie's jaw slacks when powerful emotions threaten to consume him. He tries to take steadying breaths of courage to hold his emotions in check as he rides away from his son. It's only a brief moment, but in it Heughan showed what it looks like for a heart to break open, allowing Jamie a brief moment before stealing his jaw again and committing to his exit was a truly stunning moment of acting. 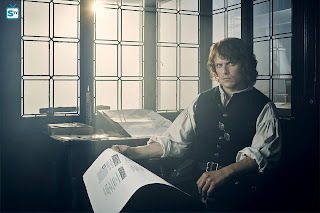 Jamie's story would then jump ahead to the iconic print shop scene that fans had longed to see. The moment came in A. Malcolm (3x6). It was this scene where Jamie and Claire are finally reunited. Despite spending so much time apart filming vastly different storylines, Heughan and Balfe easily slipped back into their old dynamics. The reunion between the characters and performers was all anyone could have hoped for. They dealt with a lot as they tried to catch up on lost time and get to know one another again. It wasn't an easy journey, and Jamie's heart would once again be consumed by another aching hole, as he learned about Brianna (Sophie Skelton). He got his wife back but had to accept that he would never again get to be with either of his children or even ever know his daughter. Jamie and Claire would go on to bicker and fight, these big scenes gave Heughan and Balfe many great opportunities to show off just how powerful and dynamic their acting partnership is. Heughan took Jamie through a whole array of emotions as he had to process a lot. He lived a lot of life while Claire was away and it took him time to reconcile who he had become with the man Claire loved. Heguhan delivered some soulful and profound acting throughout their reunion in this episode and its continuation into Crème De Menthe (3x7). A full analysis of the beautiful reunion and a full look at Heughan's powerful acting throughout these episodes can be read about in Sam Heughan's October Performer of the Month winner article. While it would be amazing to relive all these moments again there are other big milestone moments that came after that haven't been previously covered that deserve recognition. The First Wife (3x8) provided Heughan with some truly commanding moments. It was a big confrontational episode that showed the fractures still in Jamie and Claire's reunion. Learning that Jamie had married Laoghaire (Nell Hudson) shattered Claire's world, but at the same time, it also forced Jamie to again confront the man he had become since she left. There is a moment where Jamie and Claire are arguing where she asks him why he didn't tell her about his other wife. Heughan plays Jamie as forlorn as Claire scolds him, then when Jamie is asked to explain himself Jamie asks "Why?" very softly. Through Heughan's expressive eyes the audience can see Jamie internally trying to come to terms with the question himself. Then he claims to be a "coward". Any long-term fan of the books and show knows that is about as far from an accurate description of Jamie Fraser as they come. Yet, Sam Heughan delivered the description in a way that it was clearly obvious that this is how Jamie saw himself. 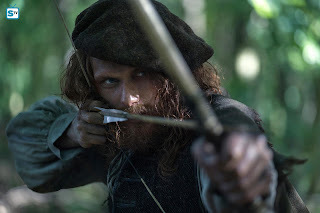 It was hard to reconcile Jamie Fraser and the word "coward" in relation to one another, but Heughan made it believable as to why Jamie felt that way. He saw himself as a coward because he was afraid to tell Claire the truth for fear that she would leave him. His explanation was delivered with a shaky voice, far from his normal firm and steady tone, and that said so much about the conflict raging within him. Heughan's decisions in this scene gave the moment even more deep-seated emotion than even was held within the pages of the book. Jamie asks of Claire, "Do you know what it is like to live twenty years without a heart?" This came immediately after he went back and forth with trying to reconcile if he blamed Claire for coming back or not. Obviously, he did not, but he was struggling to find words to explain his position, his feelings, and why he did what he did. Heughan stuck firmly on parts of the dialogue where he gave Jamie a firm strong voice and in other moments the big powerful Jamie Fraser almost appeared small under the weight of all the feelings racing through him. All at the same time, Heughan had to show and express physically and verbally, twenty years' worth of pain, love, and heartache. As the scene escalated and the fight grew in intensity Heughan latched onto Jamie's twenty years worth of jealousy regarding Frank (Tobias Menzies) and lashed out at Claire. It was a moment of passion and while he took his anger out on her, she lashed back at him. These are two hot-headed characters with so much love and passion that when they erupt in anger, it is fierce and could put the mightiest of volcanic eruptions to shame. It escalated to them nearly having an anger-fueled sexual encounter, but was interrupted by Jenny. The acting by both Heughan and Balfe in this moment was intense and played perfectly into the raging emotions between their characters. When Claire stormed out Jamie was left still not having had an outlet for his pent-up feelings. He let off some steam, but there were still things he needed to say. After he was shot by Laoghaire, he and Claire got to have a quieter moment to speak. He finally got to explain his feelings regarding why and how he ended up with Laoghaire. It was a stark contrast to the earlier scene and a truly lovely moment of acting by Sam Heughan. The show chose to play flashbacks of the moments Jamie was describing to Claire, but through Heughan's delivery of the dialogue, the moments came to life all on their own. One could close their eyes and just listen to him speak and be able to picture the scenes he was describing. His tone was soft and steady and that allowed him to paint a portrait of a man struggling to deal with unimaginable heartache that just kept growing. The way he spoke of Laoghaire's kids made it obvious before it was even said in dialogue, that Jamie was using them as stand-ins for the two beautiful children he would never be able to raise. Heughan chose to play the moment soft and it worked so well. And, when taken into contrast with the earlier scene, shows just how remarkably in control he is over his performances. 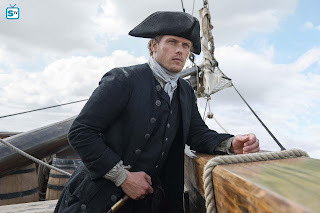 In The Doldrum (3x9) Jamie and Claire shared a beautiful moment at night on the deck of the ship they are on as they try to get to young Ian, who had been kidnapped. They are talking about the moon and Claire softly reminisces about how men went to the moon and how "Goodnight, Moon" was Brianna's favorite story as a child. Heughan doesn't have much to say in this scene, but what he does is said in a soft and loving way. This is a soft tender moment and both performers play to that. Heughan makes it clear how much Jamie loves Claire. The way he holds her to comfort her and the way he lovingly kisses her. The way Heughan handles Balfe is always so respectful and shows just how much he cares for his co-star. They have a beautiful chemistry which obviously stems from their real-life friendship. It's clear the respect he has for her. Even in their more intense love scenes where Jamie is going full on Heughan is still clearly taking Balfe into consideration and putting her first. He not only plays a charismatic nobleman but he himself is just that. Heughan's noble soft side really came out in this scene. It was clear that Jamie was looking at Claire in awe of her story just as Heughan was looking at Balfe in awe of her performance. It was a truly wonderful moment for both characters and actors. The storyline of the last few episodes would see Jamie and Claire separated again by the end of The Doldrum and the separation continued on into Heaven & Earth (3x10). Jamie went through a lot of heartaches trying to get her back. Getting her back, then losing her so soon afterward hurt his heart. The poor man just couldn't catch a break this season. Every time it looked like his heart was getting a reprieve from pain and suffering, something else happened or someone else was taken from him. Heughan did a stunning job showing Jamie try and take charge of the situation while also secretly falling apart inside with anguish and worry. The two would reunite in Uncharted (3x11) in a stunning beachside reunion. As Claire raced to the beach to try and reconnect with Jamie and the others, Jamie was preparing the ship to set sail again. When Jamie's attention was pulled to the beach and he saw Claire there was this look of awe and hope as he raced to get to her. Once he was on the beach he raced towards her. Throughout this entire sequence, until the moment Jamie wrapped his arms around Claire, Heughan portrayed this look of doubt, like it wouldn't be real for Jamie until Claire was in his arms. Then when Jamie and Claire embraced, Heughan‘s body relaxed and he allowed Jamie a moment of peace. Jamie's strong posture was forgotten in lieu of relaxing into Claire's arms. It was another moment where Heughan said just as much with his body as he did his words. Though, the way he screamed "Claire!" while running towards her was enough to melt even the coldest of hearts. That was the sound of the purest of love reuniting. Heughan put so much passion behind saying Claire's name and it really drove home all of Jamie's feelings in that single name. And the kiss they shared was soft yet full of so much need and hope. Apart they are survivors, but together they are a powerful force. It is an amazing testament to Heughan and Balfe, as well, that moments like this play with so much passion. It takes a truly unprecedented acting partnership to be able to accurately portray a love this pure and immense. The characters went on to share many more tender and beautiful moments as this episode drew to an end. Jamie helped clean and tend to Claire's wounds. It allowed Heughan to really dive into Jamie's softer gentler side as he so tenderly cared for Claire. 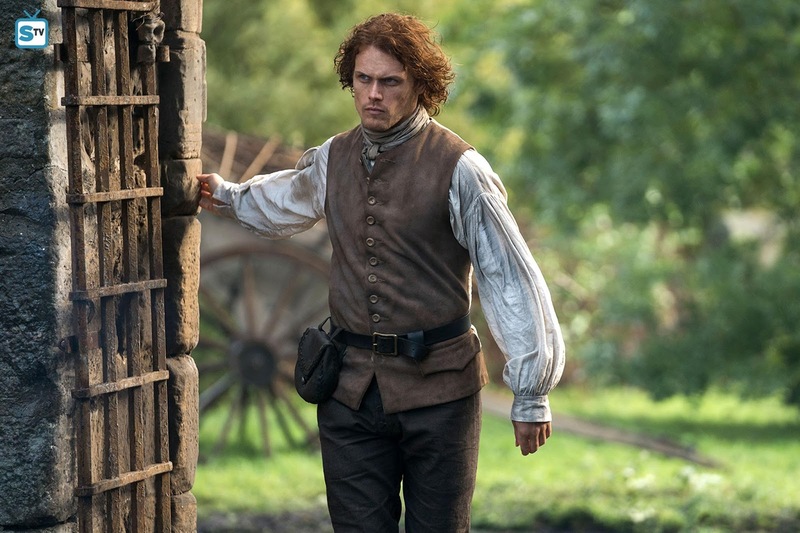 The next episode, The Bakra (3x12), saw Jamie and Claire's search for young Ian intensify. There were some genuinely great moments for Heughan in this episode, but there was one that stood out. That moment occurred when Jamie reunited with Lord Grey. He got to catch up with his old friend, with whom he had left in custody of young Willie. When he asks about Willie there is a little spark in his eyes a bit of a shake to his voice. Heughan captured Jamie's anxiety of Lord Grey's reply. Then when he learned that Willie was still riding and did indeed still remember Jamie there was a lightness that overcame him for a moment. For that very brief moment, he felt at peace with the choice he had made to leave Willie with Lord Grey. He was quickly brought down a notch when he learned that Willie only remembered him on occasion. The way Heughan played the moment displayed Jamie's disappointment. 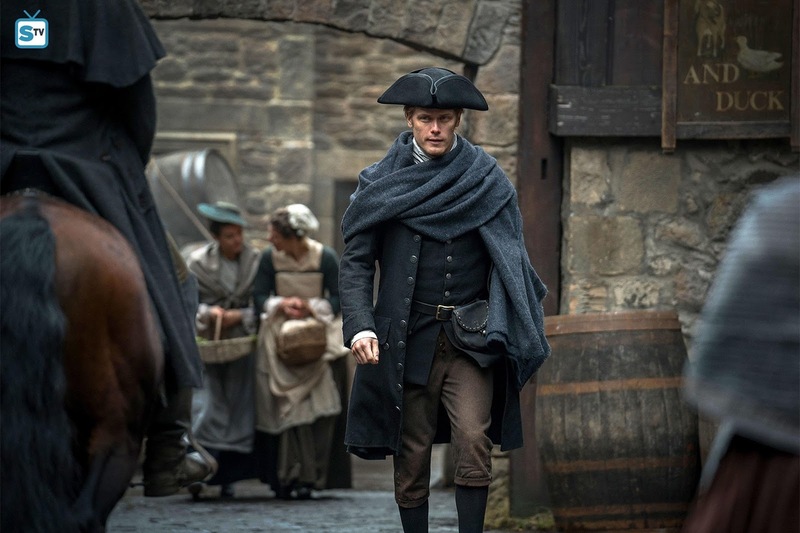 It was a complicated scene where Heughan had to navigate Jamie through this wide array of mixed emotions regarding the reunion with Lord Grey and the information about Willie. He then had to transition back into the moment as they still needed to find and save young Ian. He went from being a bit flustered and caught off guard to focused and back in control. The way Heughan makes these mid-scene transitions is nothing short of remarkable. He does it with such ease. After everything that happens in the conclusion of this episode, the season was left with a lot of ground to cover in the season finale, Eye of the Storm (3x13). Sam Heughan was given a lot to do with serious moments to full-on action sequences. They were able to save young Ian from the clutches of Geillis Duncan (Lotte Verbeek) and protect Brianna in the future all at the same time. It was an intense season finale and even after everything that happened in the episode nothing could have prepared anyone for the way it ended. In a colossal ending, the ship they are on hits a bad storm and wrecks. Claire is thrown overboard and after getting tangled in ropes she is pulled to the bottom. Jamie is able to reach her and rescue her. Heughan's strong physical prowess was put to the test in this scene. Even in a tank underwater acting is not an easy thing. The body does not act underwater as it does above. Yet he still managed to convey an insane amount of emotions as Jamie rescued Claire. Even underwater his fear for Claire's life was palpable. When they reached the surface Jamie's fear was made all the more real by the way Jamie begged Claire to not die. Heughan infused the right amount of raw emotion, authority, and fear that amplified the passionate emotions of the scene tenfold. It was impossible to not fear for Claire given the way Jamie's voice was both firm and shaky at the same time. He was trying to be strong for her but was full of fear for what he thought was his final moments with her. As they wash up on shore and Jamie crawls over to Claire, it's obvious that Jamie is saying goodbye. He genuinely thought he had lost her. The emotions that Heughan portrayed when Jamie softly kissed Claire's cheek were massive. His reaction to her then coming to and coughing her way back to life beautifully accented the prior moment. At her first cough and movement, there is a second of trepidation like he can't believe it's true. Then he accepts the fact that it really is happening and she has indeed come back to him. His entire face relaxes, complete and utter relief overcomes him. Heughan has Jamie smile down at Claire and gently touch her hair. It's almost as if Jamie fell even more in love with her. It was a beautiful serene moment to end the season and a truly wonderful final moment of acting by Sam Heughan as the season drew to an end. This was a look back at some of Sam Heughan's biggest and best acting moments throughout the season. This is only an extremely small look at all the magnificent work he did this season. No matter who his acting partner or the content of the scene he gave everything in every scene and it showed. He never delivered a moment that was anything less than impeccable performing. Sam Heughan is an acting force to be reckoned with. He is playing a character that fans of the book had put on a pedestal. In the hands of any other performer, this Jamie Fraser might not have been able to live up to his book counterpart. Not only has Heughan ensured that his Jamie was just as good as book-Jamie, but he's actually made his Jamie even better. 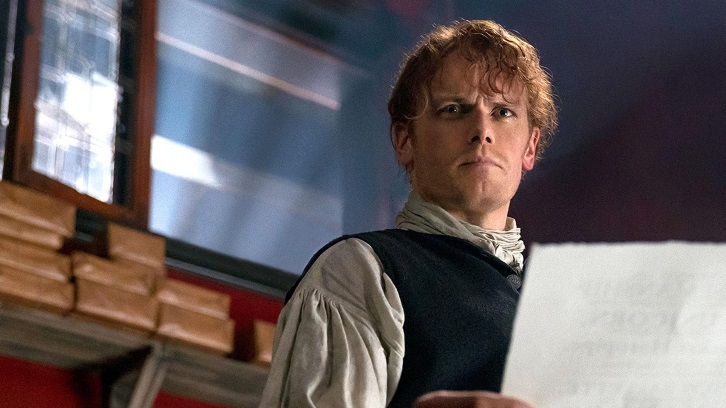 That's both a compliment to Sam Heughan and book series author Diana Gabaldon who wrote a character that no living human man should have ever been able to accurately portray. This was the perfect marriage of amazing source material and absolutely spot on perfect casting. Heughan has done spectacular justice to the character and given vivid stunning life to the man that Gabaldon first brought to life in the pages of her books. Sam Heughan is the perfect Jamie because he is as good and pure as the character he portrays. Heughan is obviously very different from his character. But when it comes to their noble hearts and kind nature they are the same. Heughan cares about people which is why he started My Peak Challenge. According to a statement from Sam Heughan on the official site for the program, "My Peak Challenge is a global community rooted in the belief that we can all effect positive change in our lives while helping others." That speaks volumes about Sam Heughan as a man. He is an actor by profession, that's what pays his bills, but he's so much more than that. He is a man who cares to make a positive change in the world. He has taken his celebrity status and turned it into something beautiful and powerful to help others. This, as much as his incredible acting skills, is why he has become so beloved by his fans. This was a huge season for Jamie Fraser meaning that Sam Heughan had a ton to do. He delivered his lines with impeccable timing and stunning skill but he also acted just as much with nothing more than his eyes and body. He is an acting force of nature and incredibly good at his craft. All this means is that every single scene he was in was worthy of note. Unfortunately, to avoid this article being the length of a novel they couldn't all be discussed here. So many great moments were left out of this article, so please feel free to use the comments section to discuss all the moments not covered here. Also, feel free to elaborate on your interpretations of the scenes that were mentioned. For all the reasons noted in this article, it is clearly evident why Sam Heughan was voted as SpoilerTV's 2017 Reader's Choice Performer of the Year. Take a moment to celebrate him in the comments and enjoy in the company of fellow fans of this immensely talented performer.